Each political cycle, candidates vying for public office warn that the upcoming election is the most important event of the millennium. For many whose names appear on a ballot, the statement is at least partially accurate: their political future rides on the outcome. The rest of us take such forebodings with a grain of salt. After all, how much damage can a single candidate (even a president) inflict given our time tested system of checks and balances? Turning Point makes the case for "plenty"; Barack Obama's transformative agenda has indeed remade America – to the detriment of our economy and culture. In his third book, Governor Robert L. Ehrlich details the considerable damage inflicted to date, while analyzing how progressive policy has made America a far more insecure and weaker country. 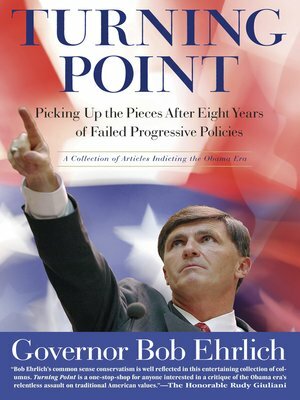 Culled from published opinion pieces authored by the Governor over the last eight years, Turning Point is a concise, articulate indictment of Western European style progressivism brought to America by its most charismatic (and dangerous) salesman. The presidential election of 2016 is a pivotal one. As such, Ehrlich asks whether Obama's agenda is indeed America's future. In other words, has the cumulative impact of progressivism reached the point of no return – or – will the next election cycle be a turning point for the return of common sense conservatism?